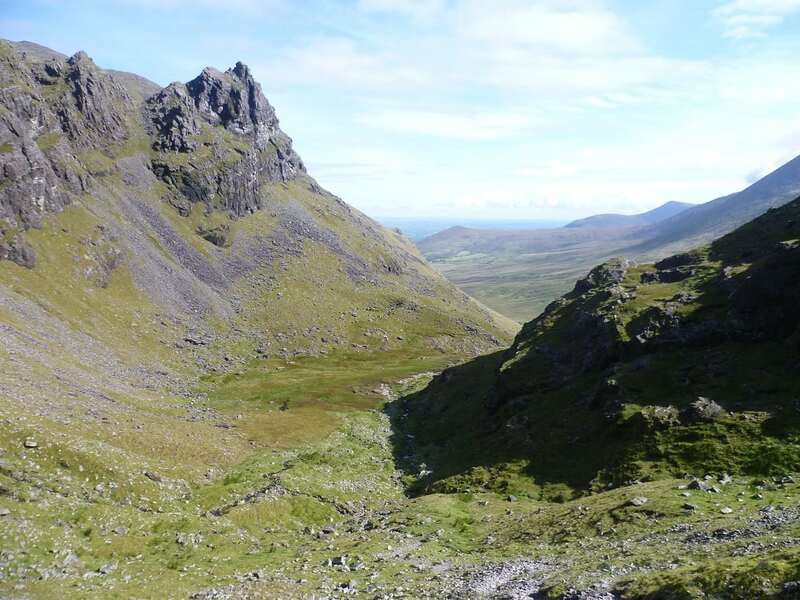 The Brother O'Sheas Gully approach to Carrauntoohil is a moderate to strenuous 5-6 hour (13km) walking route to the summit of Carrauntoohil Mountain (1,039m) and return via the safe if not sometimes difficult to find Zig Zags (a small stone marker has now be created). 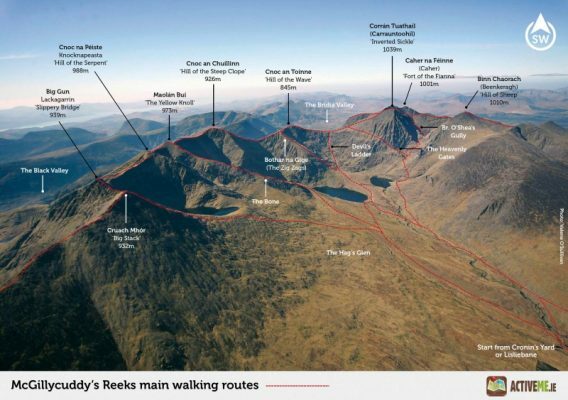 This is now one of the more popular routes to the summit for people avoid the Devils Ladder with the route starting in the traditional start point of Cronin's Yard near the town of Killarney, Co. Kerry in the south west of Ireland. It is a relatively safe and interesting climb with a few easy scrambles. 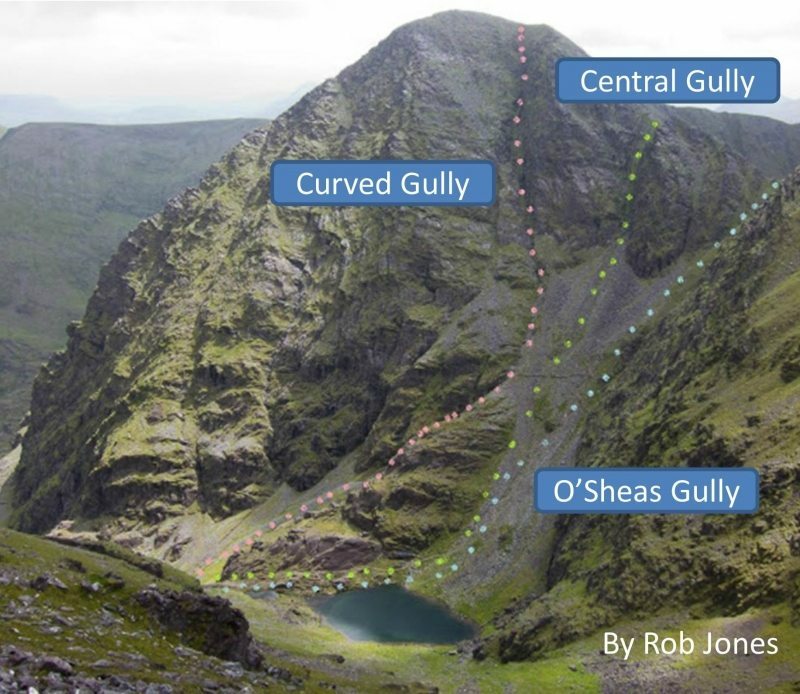 This route is considered the easiest of Gully routes on the north west side of Carrauntoohil with the Curved and Central Gullys considered more difficult than O'Sheas Gully. From teh traditional starting point of Cronin’s Yard (or Lisleibane), follow the well worn path into the Hags Glen, passing a few steel bridges over the Gaddagh River and some other streams. At a point just before the stepping stones, you turn right for O’Sheas Gully or other Gully routes. For other route including the Devils Ladder you continue straight using the large stepping stones to cross the river. 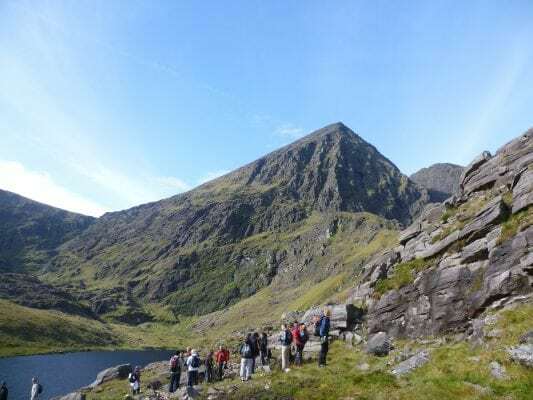 Please note that if you have not walked this route before, care is required to reach to what is known as Level 1 above Lough Gouragh in the Hags Glen. There are one or two places where the route is quite exposed some may find this daunting if they do not have any mountain experience. There are a number of short rocky steps requiring some easy scrambling so a personal guide could be handy to give you more confidence. Shortly afterwards this easy scramble, you emerge onto an area of flat ground known as the ‘first level’ (Grid Ref. V809849) with great views of the Reeks. 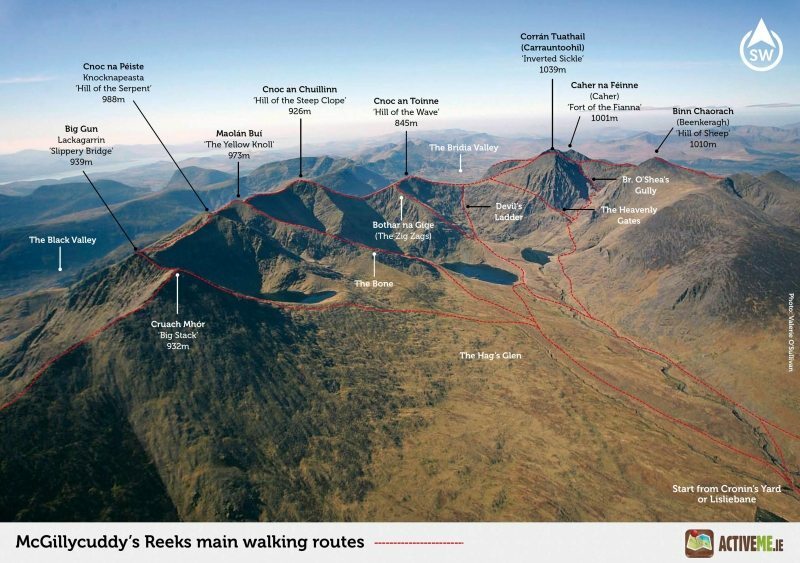 See http://www.kerrymountainrescue.ie/routes/brother_osheas.html for more information, routes and photos. Plan your walk by checking the weather, sunrise sunset times and our hiking checklist on our website https://www.activeme.ie/useful-info/planning-a-trip/. Please remember that you are only as fast as the slowest member of your group! Use our Map of Ireland and Sat Nav tool to get directions to the start point and our detailed maps and GPS on our ActiveME iPhone App and Android App to find and follow the walking route live on screen and keep on track. Our maps and Apps are only a rough route guide and at all times should be used in conjunction with proper map and compass navigation techniques. You are also advised to take into account the weather and have permission to access any lands. Feel free to send us your photos and add you own star rating, comments or suggestions below.